Topic: Better keeper, Ray or Wood? Re: Better keeper, Ray or Wood? Keeper league, so building for the future really. Better keeper, Ray or Wood? Trying to a swing a deal for Darvish/Devers. Will be sending Rendon and Ray/Wood in return. Who of the 2 should I send packing? Topic: Grey, are we dropping Odor yet? Grey, are we dropping Odor yet? 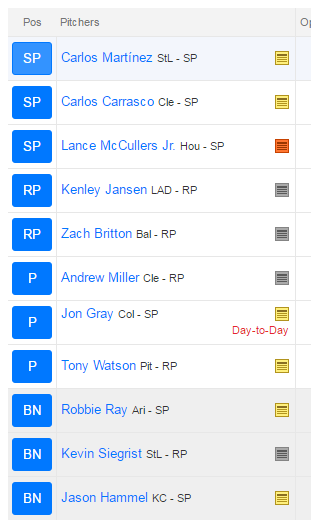 Have Jon Gray occupying my only DL slot. But, also have Britton on the DL. Drop Gray and move Britton to the DL to free up a roster spot? Keeper league, Kershaw is costing me $49 this year, +$2 ever year we keep. Getting offered Darvish ($5) and Villar ($3) for Kershaw. I want to jump on it, but part of me says hold. Thoughts? 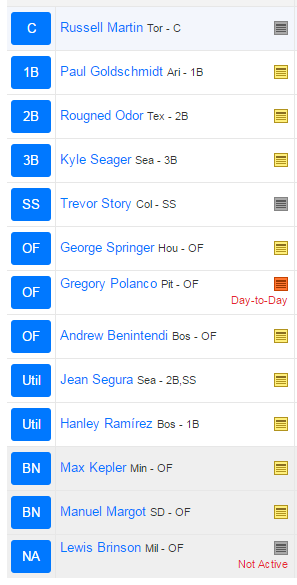 We are allowed to keep 8, plus 3 NA tagged players (minor leaguers). Right now I have 5 definite keepers, plus my NA guys. Stroman looks like a decent candidate for a keeper with this low cost, same with Erod. My final consideration would be Sal Perez or Belt. Topic: Which SP has most trade value? Drop Ross? 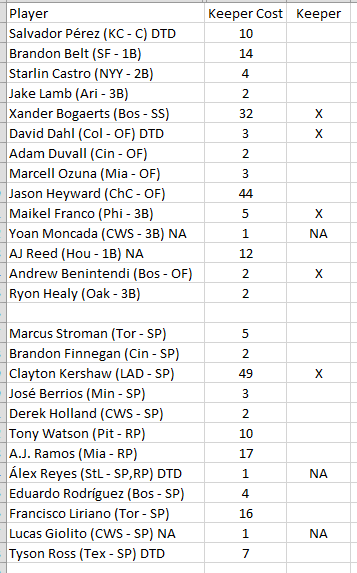 Which SP has most trade value? Drop Ross? Topic: What do I do with this apparent dumpster fire? Re: What do I do with this apparent dumpster fire? Just ride it out? Or find a better deal?